“At my age….” How many times have you said that? 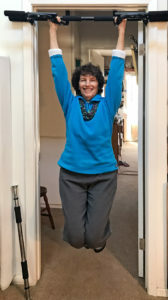 Well, at my age, believe me, the thought of doing a chin-up never crossed my mind – that is until age 71 when I met Katy Bowman (www.nutritiousmovement.com) and began integrating her practices into my daily life. 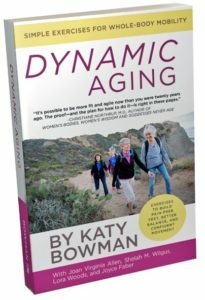 That resulted in our book Dynamic Aging: Simple Exercises for Whole-Body Mobility by Katy Bowman with Joan Virginia Allen, Shelah M. Wilgus, Lora Woods, and Joyce Faber. In fact, I daresay doing chin-ups had NEVER crossed my mind period! I didn’t do them as a kid, a teen or any time thereafter. In fact, hanging in general was something I did briefly before my teens and that was it. So how is it I am involved in a “Chin-Up Project” at age 79? 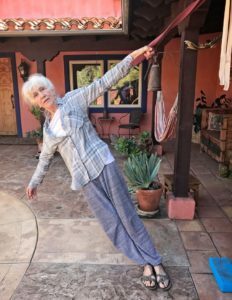 One morning in August 2017 I was teaching Katy’s exercises for a “hanging – non-hanging” class. * Shelah was attending. 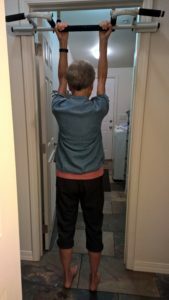 We got to talking about chin-ups and next thing you know we had decided to see if we could do one chin-up by our 80th birthdays (both in May 2018). We figured that would be plenty of time to work up to it. Well, we’ll see. Many thanks to Master RES Instructor Tim Harris for personally coaching us. (Tim is the “mystery man” on the back of our Dynamic Aging book and he will be featured in a future blog.) He is helping us with basic exercises to develop the muscles necessary for hanging, some of which we demonstrate below. The big thing for us to remember (and for anyone beginning to hang) is to take it very slowly. These may be muscles that have not been moved in this way for a l-o-o-o-o-o-n-g time. A couple months after Shelah and I started training, Lora opted to come on board. 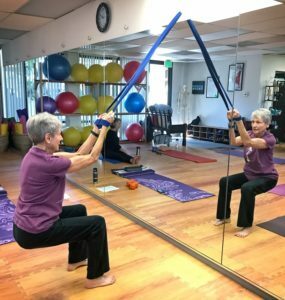 So now, if Shelah and I are unable to do our one chin-up by OUR 80th birthdays, maybe we will be able to by Lora’s 80th – she will be 77 this September 2018. One of the questions I have is whether my body “at this age” can actually do a chin-up. Is it physically possible? I don’t know…and I’m going to find out. I do have a role model: A German woman, Johanna Quass, made the Guiness Book of Records as the “oldest gymnast in the world” in 2012 at age 86. Today at 92, check her out here on YouTube: https://tinyurl.com/y9y9rt39. She did have the advantage of starting when she was 10. Shelah and I have never done a chin up; Lora says she did a few when she was a kid. Who really knows what the human body is capable of at any age? Records are made to be broken. I remember English runner Roger Bannister who in 1954 was the first person to run a mile in under four minutes. Up until then it was believed the human body was physically incapable of running that fast. (Today, the record is 3:43.13 run by Hicham El Guerrouj of Morocco in 1999.) So, I wonder if MY human body at MY age is physically capable of doing a chin-up. Stay tuned. What is a “chin-up” versus a “pull-up?” A chin-up is generally a little easier because your hands are turned so the palms are toward your face. For a pull-up your hands are turned with palms facing away. In October we spent a few hours with Katy and mentioned our Chin-Up Project. Since we have been preparing for and working on hanging since her blog called Hanging and Swinging 101 written in February 2013,** we have some familiarity with the muscles involved. She suggested as a next step we get into a position where we have our chin over the bar and then slowly – in a controlled fashion – lower ourselves to a full arm extension. Here I am finally able to do it in November 2017. Of course, I was/am delighted; however, the big challenge now is how do I get back up?!? Following are some photos of Shelah, Lora and I at work doing the preparation step by step to develop the necessary strength in the muscles involved to do a chin-up. Hanging out to the side can be done using a yoga strap or a door casing. 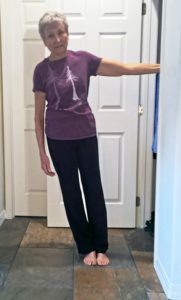 The trick is to start more upright with a slightly bent arm and work up to where you can straighten your arm and move your feet so your body is at more of an angle bearing more of your weight. Joan and Shelah demonstrate how you can use a yoga strap starting from a squat to pull up. Then gradually take one foot off the floor to bear more weight and help build the necessary muscle strength. Hanging itself is helpful. Gradually start with both feet on the floor. Then add more weight as you are able. 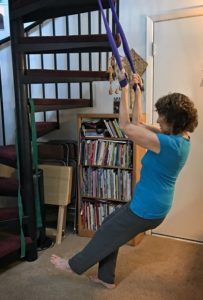 PLEASE NOTE: If you think you might be interested in learning how to hang without hurting yourself, be sure to check out Katy’s blog about how to start hanging and swinging: https://nutritiousmovement.com/hanging-and-swinging-101/ (see if you can spot Joyce and me). Pay special attention to her recommendations for preparing to start working these muscles. This is not something you want to rush into without proper and adequate preparation. * On her website Katy has Virtual Class Membership https://nutritiousmovement.com/virtual-class-membership available where she teaches classes on-line for a nominal monthly fee and continuing education units for Nutritious Movement certified RES (Restorative Exercise Specialists™). You have all inspired me. As Lora’s younger sister, I feel the need to join the one chin up group! It is a chin-up bar for a doorway that fits over the door frame and is available on Amazon. Thank you! A much better explanation of chin-up preparation than by my exercise physiologist here in Australia. Such an inspiring and informative story. Thanks for sharing. I’m off to find something to hand from! I’m impressed and encouraged! And curious as to what that bar contraption is in the doorway you’re hanging from?? ?